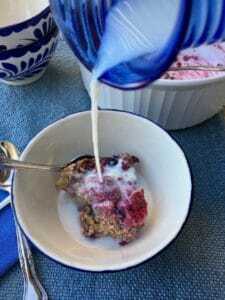 Berry Cardamom Baked Oatmeal. Steel-cut oats, berries, and nuts baked in a spiced custard is breakfast that make you rise, shine and smile! Years ago my husband decided to cook omelets for friends who joined us for the weekend. When he announced, “I’m going to flip this!” I thought: Uh, oh. I watched the flip and then followed the omelet as it slid down the side of the stove and fold onto the floor. Sometimes you need a go-to recipe for guests that doesn’t end in theatrics or a mop. Or you want a recipe to serve your mom when you celebrate her on Mother’s Day. This is it. This is also the recipe to make your mornings run easier. What this isn’t is one of those recipes that takes more time than it’s worth. Hearty, satisfying and flavorful. 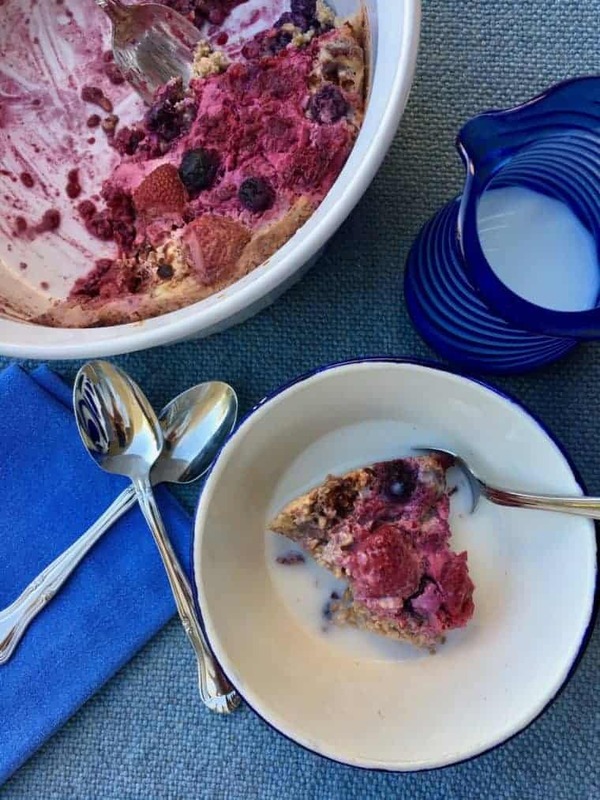 Berry Cardamom Baked Oatmeal is more like overnight oats that are company worthy. 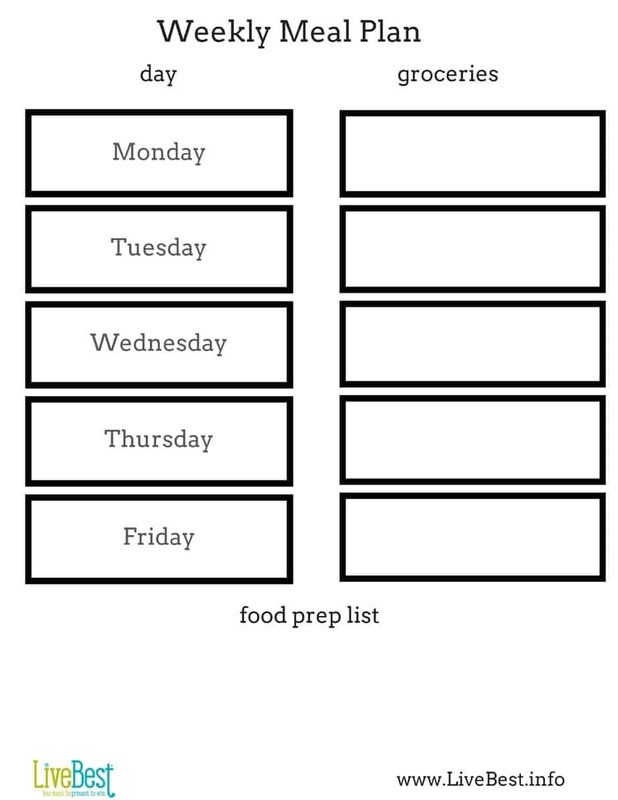 It can be made ahead and comes together quickly, making it an easy breakfast to serve overnight guests or to bake on the weekend to eat throughout the week (here’s a LiveBest Meal Prep sheet). It’s good warm with milk or topped with yogurt. Or cold, straight out of the fridge as a late night bite. Baked oatmeal keeps 3-4 days in the fridge and the flavor improves over time as the cinnamon and cardamom infuse the dish. Cooks around the world use cardamom. The aromatic spice flavors Thai curries, Scandinavian sweets, and Masala Chai. Whole-grain steel-cut oats, fruit, nuts and spices add texture and flavor. In this recipe, I’m using cardamom. Cooks around the world use cardamom for its warm, spicy-sweet flavor. The aromatic spice flavors Thai curries, Scandinavian sweets, and Masala Chai. If you don’t have cardamom, substitute ginger or a 1/4 teaspoon each of clove and nutmeg. Rather than berries, you can substitute sliced bananas or apples, or frozen or canned peaches. Milk, cottage cheese or yogurt, walnuts, and an egg boost the protein while the oats, fruit, and walnuts add fiber. All together they make a meal rich in mother-approved healthy goodness. But moms aren’t the only ones pleased. It seems the more whole grains we eat, the happier our gut bacteria are too. 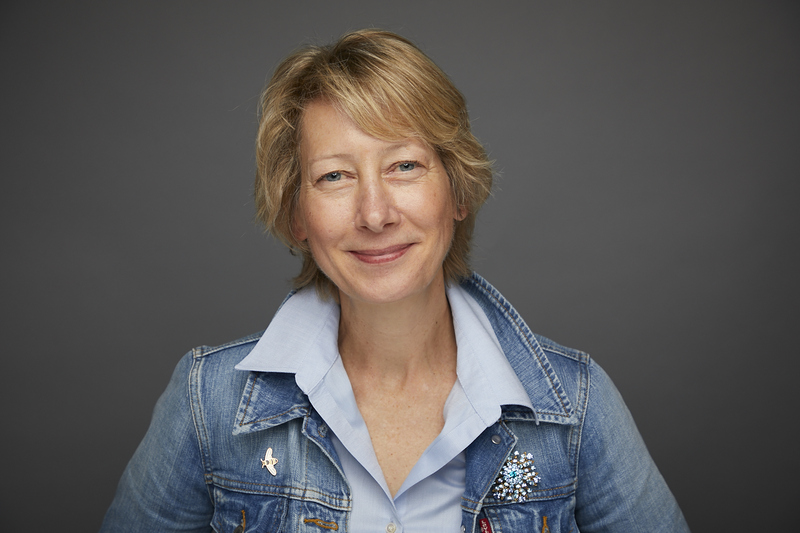 Researchers at the University of Nebraska found that eating whole grains even for a short period altered the gut bacteria to reduce systemic inflammation, which may be at the root of many chronic diseases. Oats are whole grains, but steel-cut oats are thicker than rolled oats, so have heartier texture and nutty flavor. They take longer to cook but are also slower to digest than rolled or quick-cook oats. Even better is that each spoonful carries fiber. For every seven grams of fiber added to daily eating, the risk for cardiovascular disease and heart disease drops by nine percent. This recipe has about 4 grams fiber per serving. Talk about healthy goodness! It’s not oatmeal, as usual. The spices, fruit and nuts add texture and flavor. Cardamom has a warm, spicy-sweet flavor, but if you don’t have cardamom, substitute ginger or a 1/4 teaspoon each clove and nutmeg. Rather than berries, bananas, peaches, or apples are good too. 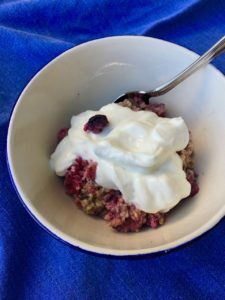 Milk, cottage cheese, flax seeds, walnuts and an egg boost the protein to 8 grams per serving and oats, fruit, flax seeds and walnuts add fiber to nearly 4 grams per serving. Together, they make a meal rich in healthy goodness. Steel-cut oats add a heartier texture. It comes together quickly and can be made ahead, making it an easy breakfast to serve overnight guests. Even better, make it for yourself. It keeps 3-4 days in the fridge. If you want to snazz up your oatmeal, pour your milk from a fun pitcher and serve it in a cute pottery bowl, like these on Etsy. This is a fiber-rich recipe. If you want to step fiber in your food, I created a free, 5-day challenge you can join by clicking this link. You’ll get tips and tools, resources and recipes to create your own roadmap to meet your fiber goals. Don’t ya? Won’t ya? Seriously, it’s only 5 days 😉 Find it right here. P.S. 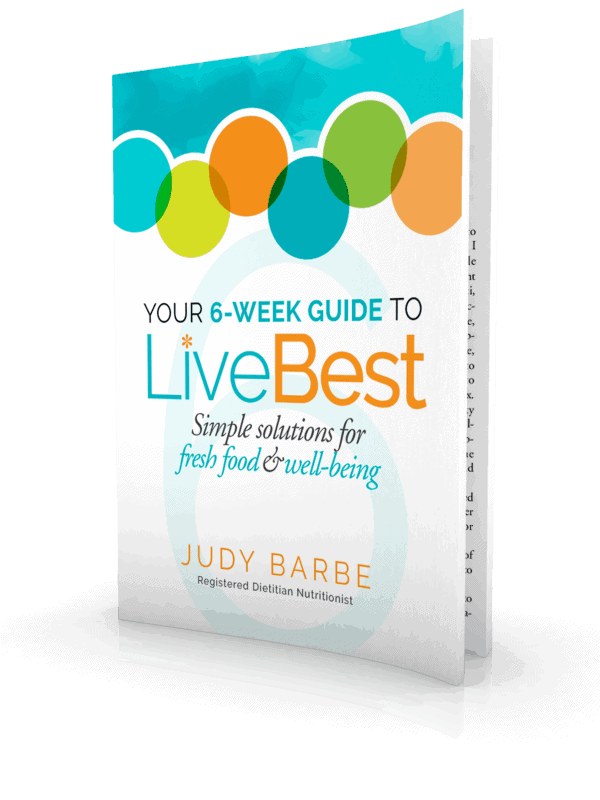 Want more healthy living tips & recipes? Sign up for my newsletter right here. Cook along with us in our YouTube video! 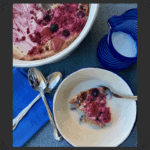 Berry Cardamom Baked Oatmeal. 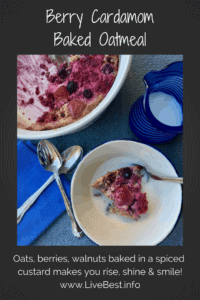 Oats, berries, and nuts baked in a spiced custard makes you rise, shine and smile! Prep: Heat oven to 325°F. Lightly spray a 1-quart or 8 x 8-inch baking dish with cooking spray. Sprinkle 1 cup fruit in bottom. Oatmeal: Combine oats, nuts, flax seeds, cinnamon, cardamom, and salt in the baking dish. Spoon over the fruit in baking dish. Combine milk, egg, cottage cheese (or yogurt), honey in a blender. Blend thoroughly. Pour liquid ingredients over oatmeal. Sprinkle remaining 1 cup fruit over milk mixture. Bake at 325° for 40 minutes or until lightly browned and set. Serve: warm or at room temperature. If serving later, cover and refrigerate. Warm in 325° oven for 20-30 minutes (or microwave) before serving. Top with milk or yogurt. Have not tried yet, but sounds good. Could you use Quaker oats instead? Have never had steel cut oats. I would love to try this dish because it sounds delicious but I am vegan and would have to replace the egg, milk and yogurt. I believe nut milk would be ok any suggestions on the egg and yogurt?? Hi Tee, thanks for the note. A plant-based milk and yogurt should work as substitutes. Or replace yogurt and egg with soft tofu and maybe some nut butter. I suggest blending these together in the blender and then pour over the oats. Sound doable?